Spring financial aid will be available to use at the bookstore December 10-January 23. Looking for some extra cash for Christmas? Sell back your textbooks at the bookstore December 10-14. Fall book rentals are due back to the bookstore on Friday, December 14. 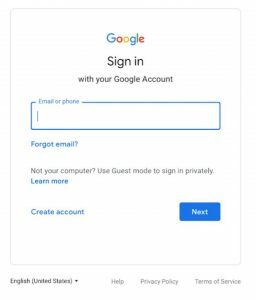 Starting November 27, we’ll make some small changes to the appearance of the Google sign-in page. These follow changes made earlier this year, which updated the sign-in page to match the Material Design principles used in other Google products. Specifically, you might notice outlines around some entry fields, and changes to the spacing and styling of other text on both the web and mobile screens. The changes will start to take effect on November 27 and may take up to two weeks to reach all users. The image to the right depicts the sign-in page that will start rolling out on November 27. For further questions, please contact the NMC Technology Help Desk at 231-995-3020 or nmc.edu/help.